Today makes it 10 years since you passed away. It seems like both a much longer time and a much shorter time. I didn’t think it would still be this hard, that I would still miss you this much, even though you’ve been gone so long. I am always grateful that you were there on my wedding day. Having you there meant so much to me. I really wish you could have met Landon and Oliver though. I know you would have been an amazing Grandpa to the boys. Oliver looks so much like you it still startles me sometimes. The other day I put him in a little plaid shirt and couldn’t help but think how good he looked in it, only to realize later it was because that was the style that you wore. You were always there for me Dad. You were like a safety net that I never properly thanked or acknowledged. I always knew, if anything went majorly wrong in my life that I could call you, and you would help fix it. I’m sorry that I was so young, that I didn’t understand how important you were to me while you were here. It’s with the wisdom of an adult and a parent that I look back and realize just how HARD you worked, how much of yourself you put into making sure your family had everything they needed. I wish I could kick teenage me sometimes for not helping you out more, especially with the business. I feel that you died, in part, because you were too busy taking care of the business, and of others, than to take care of yourself, of your health. You had high blood pressure, and that was what most likely caused everything else to go wrong. Because of your example, I realized I needed to do something about my own health. I’ve been working out and eating better in hopes of living a longer life than you. It’s a hard lesson, and it was a hard way to learn. I hope I’ve got the strength to keep the weight off and to eat right. I want to live to hold my grandchildren. I miss you daddy. I always will. It is easier now, than it was. But I still miss you so much. I love you dad. I do tell the boys about you, and we have pictures of you up. They’ll at least have an idea of how amazing you are, even if they never got to see it first hand. You are five. How did this happen? It seems like just yesterday you were a tiny little baby. Yet here you are, already having started Kindergarten! I am so proud of you. You are such a good, smart little boy. This past month we’ve had some fun adventures together. We explored the local aquarium again, and we attempted to eat at the Rainforest Café. You were so frightened by the animatronics animals and fake thunderstorm that we left before we could even order. You and I went to see our first play together, a children’s theatre showing of Pinocchio at the Hale theatre in Gilbert. You seemed to really enjoy the play. We also went to a baseball expo, where I realized you have not really learned anything about the sport before. Teaching you how to hold a bat and throw a ball was fun, but you need some more work on it. You don’t seem to be very interested in sports, overall. Swimming on the other hand, is something you do enjoy. We hit the local water park and I got to take you on the waterslides for the first time. You thought this was so much fun. You had no fear, and insisted on going down the Banzi slides, which are some of my least favorite slides in the park. You swam very well, although you had some trouble at the bottom pools swimming away from the slides. Your swim class is going very well too, and you love to get in the pool. We took two trips out of the heat this past month. The first of those was a weekend at the family cabin. You did very well on all the hiking and had a blast playing in the water by the falls. You love to attempt to skip stones and splash around. Laura’s family was with us, and you and Darion had a great time playing together all weekend. 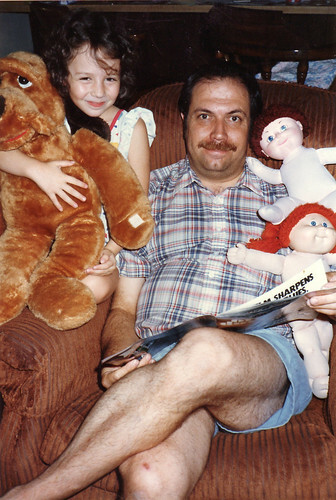 Your love of video games knows no bounds, and you spent a lot of time on the Nintendo upstairs as well! 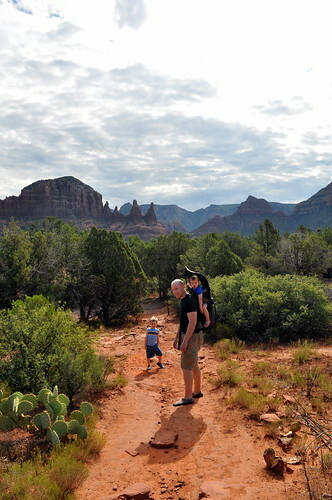 The second trip was an overnight trip to Sedona. You did not have as much fun on this trip, and you expressed to us multiple times that you would rather sit and play games as explore or shop. You did well on our hikes, but shopping is not your thing. With school just a few days away, I took a little time off work to spend time with you! We went bowling, roller skating, and to Gameworks to play video games. You had a lot of fun playing and learning how to skate. You still fall down a lot, but you got better the longer we practiced! It was so much fun. Of course, the big news this month is that you started Kindergarten on August 10th! You are attending a local school, but we are driving you out of zoning so you can be in a Dual language class. So far you don’t love the class, you told me that it is “too loud,” and that “some kids don’t like me.” I’m a little worried about that second one, but we will see how it goes. After school you go to the onsite aftercare, and you really do like that. This morning you asked me if you could skip kindergarten and go straight to the aftercare class. Your recent new love is Phineas and Ferb. That show and Mario are your too favorite things right now. You are always asking us to put on another episode of Phineas and Ferb. Your favorite character is Ferb! You are still an incredibly picky eater, which limits what I can send with you for lunch even more. I’m not sure how to get you to eat new foods. Your birthday party went very well. 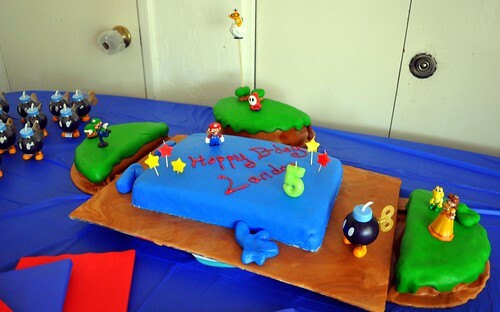 Your dad and Melanie made an awesome Mario cake just for you! You had a lot of fun at your party with all your friends in the pool. Once your birthday was over you asked me when your next birthday was. For lunch on your birthday we met up with Uncle Jack and Uncle Sam over at Red Robin, where you enjoyed your noodles and orange slices. You are so excited to be five! It’s so much fun to spend time with you, you are an awesome boy! I’m so happy to have you as my son. I took the last couple of days off from work in order to spend time with Landon before he started school. We went bowling and roller skating, and spend some time at the arcade as well. Oliver went to Laura’s so that Landon and I wouldn’t have to stress about it. Bowling was a bit dull, honestly. Landon had the bumpers, and he couldn’t really get the ball going very fast. He would bowl down the lane, and then have to wait a while for the ball to hit any pins. Overall, he seemed to like it, but was totally done after just one game. This was okay with me. We went to his favorite Burger King for lunch, and he got to play around. For me, the best part was skating. I always forget how much I LOVE to go skating. It makes me so happy to be able to skate around the rink. I know it’s silly, but it’s true. This time around, I realized I hadn’t been skating since we lived in Portland, over six years ago. On the bright side, I remembered how without issue, and had a grand old time. Landon, however, had some issues. Keep in mind that’s his first time on skates, ever. Landon had issues in part due to the fact that he doesn’t often have to work hard at things, I think. He didn’t like the fact that skating takes work. Beyond that, the video games they had on the other side of the rink were a constant distraction for him. Every time we skated by them he would fall down, because he was trying to see what was going on with them. Thankfully, he did improve quite a bit during our time at the rink. He was done after a about an hour of skating, but the amount of his improvement was good to see. They offer “lessons” early Saturday, so I want to take him back in a couple of weeks and see how that plays out. Landon also got a haircut and spent time at gameworks the next day. He had a great end to his summer vacation! After his first day of school yesterday he had swim class. He’s still doing well in swim class, but I was amazed at how few people showed up this week. Oddly, of the four total people in swim class this week, one of them is a little girl in Landon’s kindergarten class! Her mom totally recognized me from meet the teacher and morning drop off. I wouldn’t have been able to pick her up out of a line up, because it was so crazy. It was nice to sit and talk to another parent for a while. Meet the teacher night was crazy, and I felt bad for Landon’s teacher. I realized once we were there and filling out forms that she normally takes the information gathered from meet the teacher and uses it to familiarize herself with her students and their families in advance, but that because meet the teacher was happening less than 15 hours before the first day of classes started, she wasn’t going to get much of a chance to do that. Landon’s teacher seemed nice, he was a little nervous for his first day. When we got to the school, the place was packed. I walked Landon to his classroom while carrying Oliver. Ollie is so heavy that it gets harder to carry him one handed, despite all the workouts I’ve been doing. Landon however, needed to hold my other hand. Once the bell rang, his teacher lined everyone up and showed us where to drop the kids off in the morning. The playground is monitored for 10 minutes before school starts, which makes life a little more difficult for me, because I can’t drop him off early. I’ve been rather busy the last few days. Most importantly, I am now the mom to a kindergartner! Can you believe it? 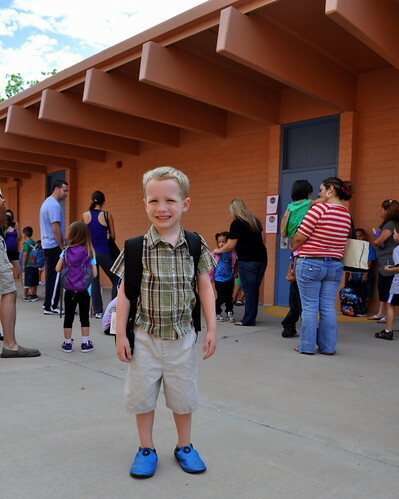 Landon started school yesterday. He is in a dual language class, where he will in theory be learning Spanish. We will see how that goes for him. Worst case, I can move him to another class/school next year, but I suspect he’ll do just fine. He did already have an incident with a kid three seats down from him spilling their milk and getting it on his stuff. *sigh* I’m not willing to make him sit at another table by himself, that just seems cruel. He hasn’t had a skin reaction to milk in a long time, and the school has instructions to wash him off ASAP if he gets any on him. I’m hoping this won’t be a thing. Honestly, Landon has been doing 1st grade worksheets at Laura’s all summer, so I know he’s ready for school. If it weren’t for the food allergy, I don’t think I’d be nearly as stressed out. Landon’s first day went well overall, and he had a very good day! 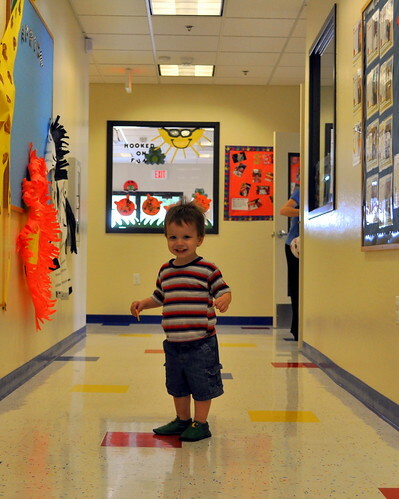 Ollie also went to his new school for the first time yesterday. They have a free “trial” day that allowed me to get some time in to hit the gym and have lunch with a friend yesterday. Oliver starts at his new school officially on Monday. Ollie had a rougher time than Landon, which is not surprising. He was tired, as they don’t nap until closer to noon, and Oliver likes to nap at 10:30AM. He liked the splash pad, (Yes, his school has a splash pad!) but was falling asleep on it. He’s a silly boy. He was less fond of the lunch they provided him. Overall, he did well though, and was active and participating. He did cry when I left, of course. 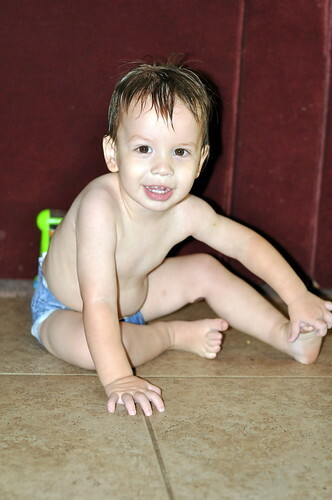 You are now 21 months old, and you seem so huge! You are wearing mostly size 3T or 4T shirts, but some 2T pants still fit you. 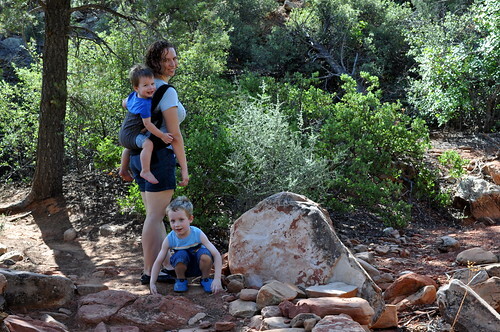 It has been an exciting month for you, as we went to the cabin and up to Sedona this month. It is so hot outside that escaping the heat has been a major mission for us. We discovered something interesting; hiking seems to put you to sleep. You fell asleep in your carrier every time we went hiking. It was rather cute. Falling asleep at the hotels and the cabin went about as well as it does at home, and most nights you manage to sleep through the night. We have it happen once or twice a week where you wake up in the night. Most of the time, turning your music back on will help you fall back to sleep, although you tend to wake up multiple times a night when you are waking up at night. We did some more local fun stuff too, so on top of two trips out of town, you also took your first trip to Sun Splash. Sun Splash is a major water park, and you liked playing in the sprinkler area and going down the small kiddie slide. You did not like the wave pool. We also went to the science center with Laura, and you enjoyed running around with your brother very much. You are on some allergy meds that do seem to be helping your snoring and breathing issues at night, but you still have issues, so we have a follow up later on this month to check into it. You are becoming more understandable when you babble, and starting to make some mild sense in communicating to us, which is handy. You still don’t have a lot of words, but it is clear you understand most of what is going on now days. It’s good to see your little mind working. We do have issues when we go to the store or go to do something you aren’t too keen on. You are just very stubborn, and in a whole new way that is all your own. You do this thing, when you decide that others are just being completely unreasonable, where you give a long blink and sort of roll your eyes. It’s a cute expression, and I’d love it more if you didn’t tend to follow it up with a temper tantrum. You are getting better about dogs. You are no longer afraid of our dogs, although you don’t like to be out with Latvia, which is understandable, as Latvia is a great dane who will knock you down. You do dislike barking dogs though. You love to give five and play high five. You are great at this game, but I think it has made you a little predisposed to hit. We’re working on teaching you to be softer. You also love to run in circles around an adult, particularly your father or myself. You laugh and giggle while doing it. You generally enjoy bath time and love getting in the pool. It makes me so happy to get in the pool with you and watch you throw yourself into the water. I can barely wait until you start swimming. I suspect next summer you will be a fish! 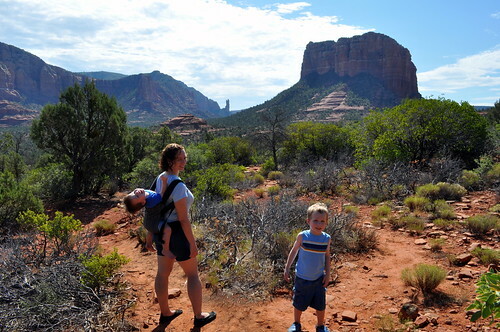 Saturday (7/30) we found ourselves on the road to Sedona just after lunch. It was a later start than we had wanted, but sometimes these things happen. We arrived in Sedona and decided to pull off and do some shopping. Ollie was running all over the place, so when we went to the next area to shop, I put Ollie in the cinchworm on my back. I should have put him on my front. Live and learn, right? We were in this really cool shop that was full of neat art cool stuff. Ollie decided to lean back and randomly grab something off of the wall, causing it to fall and break. On the bright side, it only cost us three dollars. We hit up ChocolaTree, the Live Organic Vegetarian Eatery because it was dairy free and gluten free food, and it sounded intriguing. Unfortunately, between my picky eating and Landon’s refusal of food, we were not very happy with our meal. I suspect that someone who ate more Vegan would love it, but even Ollie turned his nose up at the food. After that I either front carried him or we put him in the stroller. Landon was doing okay during most of the trip, although he made it pretty clear that he would rather be home playing video games than on an adventure. He was excited when we went to the hotel. 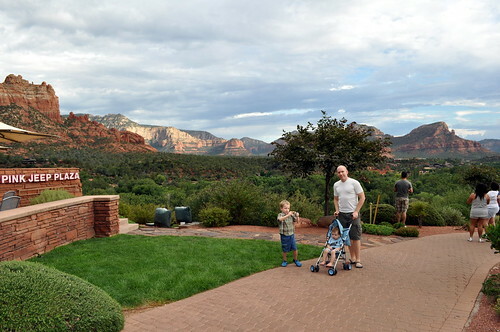 We stayed at the Rodeway Inn & Suites Iris Garden in Sedona Arizona The hotel was very nice, located near downtown. Once we got settled, we took off to enjoy downtown. 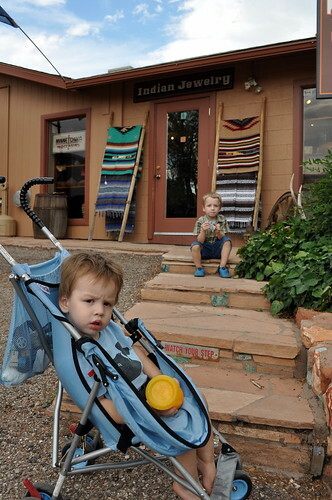 There are lots of little shops and such, and while we had fun shopping, I felt very much like Sedona is not a town for young children. The boys were not super entertained, but we enjoyed walking around, out of the heat of the valley, and enjoying the wonderful views. We ended up stopping and having a second dinner, not to mention getting some Fudge to eat for dessert! We got a good night sleep too. Ollie slept in the closet, on a cot we had brought from home. It was actually really cool, because the closet did not have doors, just some drapes, so it was like he had his own little room. In the morning we walked around the shops briefly and had breakfast. Then we checked out of the hotel and went looking for some hiking. The trail we had planned to reach ended up requiring a 4×4 to reach it, so we picked some other trails at random. I really enjoyed the hiking, the views were amazing. The rest of the family did not have as much fun. Landon is okay hiking to a destination, less so with hiking to just “go for a walk.” Bobby was not having as much fun because Ollie would doze off and then crack his head forward into Bobby. While this was mildly funny to watch, it was not as much fun to have happen to you. 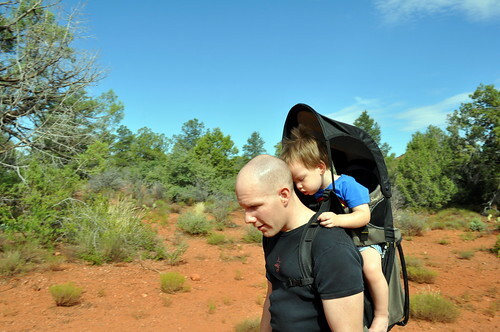 When we got to the second trail I decided a change was in order, so we put Ollie back in the cinchworm. The second hike was more fun for everyone. Oliver seemed to prefer being strapped to me, even if it was much hotter for both of us. Landon was happy because he knew that he got to sit in the car and play video games shortly. We had a pleasant drive home after that, with no major issues. All in all, a nice little weekend escape! The full set of pics can be seen on Flickr.